Antimicrobials are a class of drugs that veterinarians and farmers use to prevent and treat bacterial disease. The terms “antimicrobial” and “antibiotic” are often used interchangeably, but there is a difference. Antibiotics, along with antifungals, biostatics, antiseptics and disinfectants are all subtypes of antimicrobials. To learn more about Antimicrobial Resistance, click here. To learn more about changes for Medically Important Antimicrobials and Antimicrobial Stewardship click here. To treat disease. 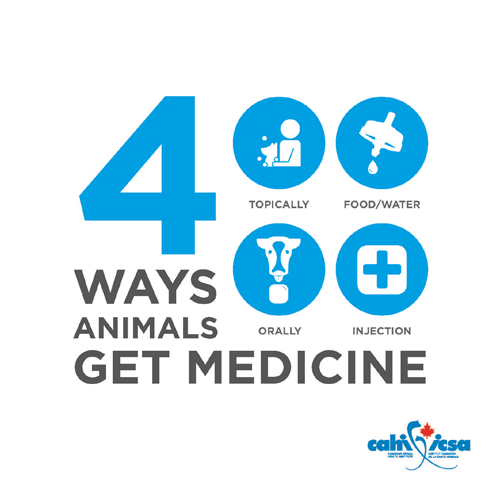 This can range from an outbreak of diarrhea in a new group of young calves to treating an abscess on a cat’s tooth. To control disease. This involves the use of antimicrobials to reduce the spread of a specific disease to others after an animal in the herd or flocks has been infected. To prevent disease. This approach, when used under veterinary oversight, can be a responsible and safe way to promote animal health and welfare. Regardless of the type of livestock farming (e.g. conventional, extensive, grass fed, free run), farm animals are usually housed in groups. Within groups of animals, or people, there is usually a certain number that will have some form of illness - whether they are showing symptoms yet or not. Typically, for a short duration such as during times of high stress for an animal (e.g. following transportation, weaning), an antimicrobial is provided. To promote growth. In 2014 members of the Canadian Animal Health Institute agreed to approach Health Canada’s Veterinary Drugs Directorate to voluntarily remove production enhancement or growth promotion claims from all medically important antimicrobials used in human medicine. This policy went into effect on December 1, 2018.